Began playing the piano at age 3, and the flute at age 11. She graduated from the music department at Toho Girl’s High School, Toho Gakuen University, and graduate school of the same university. Won 3rd place in the “Nippon Flute Concours” (also won Audience award, and Mushakoji Senke award), 2nd place in the Japan Flute Convention Competition, “Kan Dagakki Concours”, and 1st place in the “Nippon Mokkan Concours” (alos won the Cosmos award). She has performed as soloist with, New Japan Philharmonic, Japan Philharmonic Orchestra, and Kansai Philharmonic Orchestra. Has performed at “Ozawa Seiji Ongaku Juku”, Kurashiki Ongakusai”, and Saitou Kinen Festival. In 2006, released the CD “Flute Revolution” from King International. 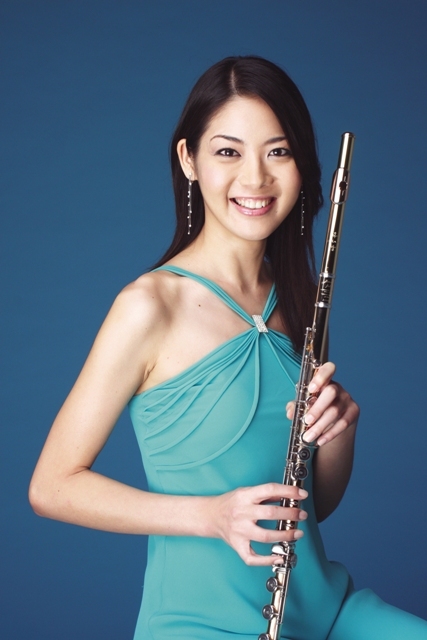 Studied flute under Takako Miyake, Souichi Minegishi, Akira Shirao, and Shigenori Kudou and chamber music under Kazuoki Fujii and Yoshiaki Suzuki. Currently performs solo and with various chamber orchestras. A member of Japan Philharmonic orchestra and Kioi Sinfonietta Tokyo.